The market was definitely on the defensive last week, but when all was said and done, was still standing as of Friday’s closing bell. 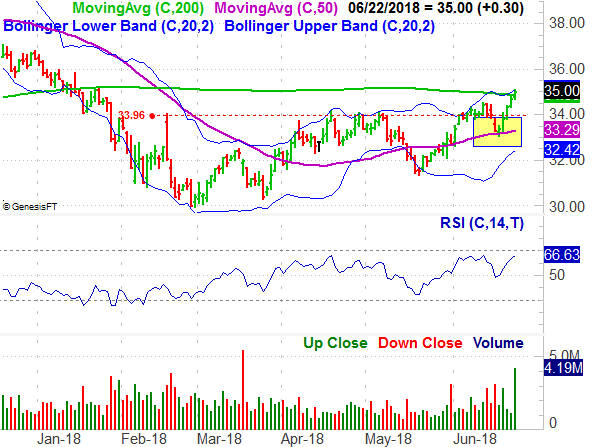 Even General Electric (NYSE:GE), which has been struggling ever since it was announced it was to be replaced by Walgreens (NASDAQ:WBA) as a Dow Jones component, managed to hammer out a gain, reversing a rough patch. It was rival Rite Aid (NYSE:RAD) that stole the show, however, tacking on another 2.5% during Friday’s trading session on news that shareholders would soon be voting on a proposed merger with privately-held grocer Albertson’s to create some much-needed synergy… a prospect that’s been nudging RAD upward for several weeks now. All the same, with the near future remaining unclear, it’s wise to look at trades on both sides of the market. 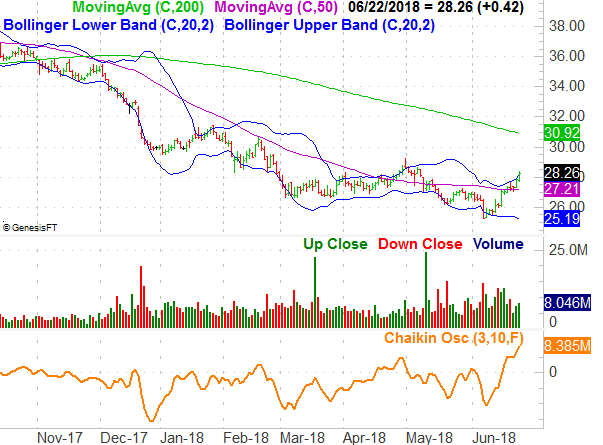 PPL Corp (NYSE:PPL), Caterpillar (NYSE:CAT) and Iron Mountain (NYSE:IRM) are among the most noteworthy prospects to mull as the new week begins. Truth be told, one could easily substitute another utility stock in for PPL and achieve a similar result. The group has been struggling since the latter part of last year, with the prospect of rising interest rates working against their dividend orientation. PPL, however, has a few more clues working in its favor suggesting it’s got at least a couple more edges that other utility names don’t quite have. One of those clues is the sheer amount of bullish volume we’ve seen take shape since the hard reversal following the early-June capitulation. The Chaikin oscillator, which is essentially a volume-weight momentum line, has soared to multi-month highs. The other telling clue is the shape of the June reversal bar thus far. After a sharp move to a new 52-week low, the bulls have decidedly changed their mind, with the stock moving within reach of last month’s high. PPL and its peers are still subject to changes in the interest rate rhetoric, but it looks like the sellers are starting to realize they overshot. 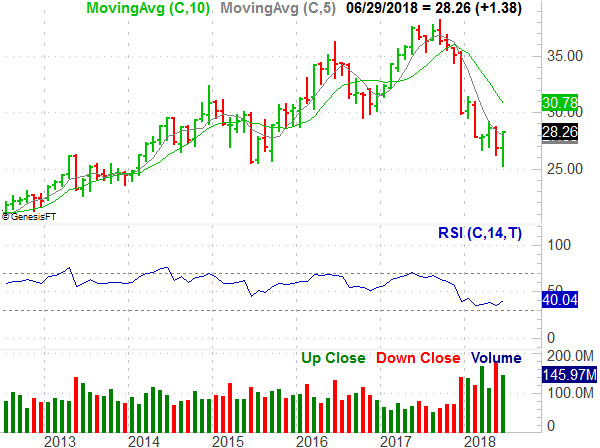 With just a quick glance it would be easy to assume Caterpillar shares are simply bouncing around in a sideways range rather than toying with a more serious breakdown. And, maybe that’s the case. 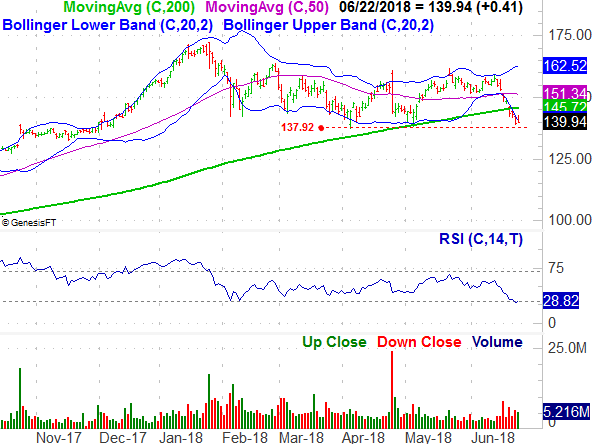 A closer look at the daily chart, however, shows that CAT stock has already broken below the 200-day moving average line (green) and is taking aim at a major floor around $138.00. It’s possible that floor could set up yet-another rebound move, but there’s something curiously different about this particular lull. The ‘curious difference’ is the volume we’ve seen in conjunction with the break below the 200-day line. There’s been a lot of selling volume at a point in time when volume should be drying up. It may be a clue that lots of pent-up profit-taking is about to get unleashed. If and when $138 snaps, there’s nothing left to catch the stock. The fact that the highs and lows for the past three months are about the same is telling. 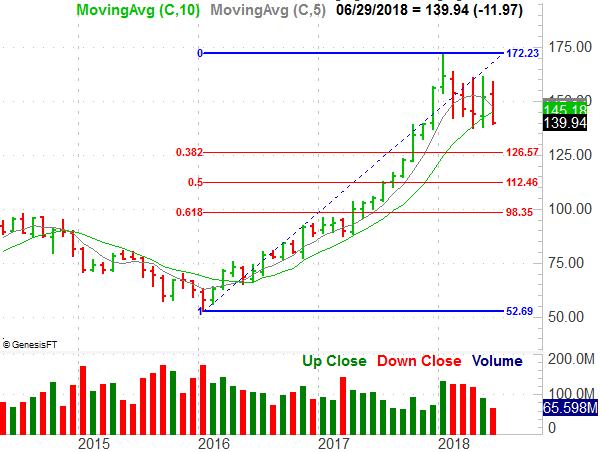 Caterpillar shares are being ‘boxed in,’ which effectively makes the chart spring-loaded… an explosive move ensues once the established pattern is disrupted. Using Fibonacci retracement lines on the monthly chart, the most plausible downside targets are around $127, $112 and $98. As one fails to act as a floor, the next one becomes the most likely low. Last but not least, though a cross of the 200-day moving average line in and of itself isn’t a stellar buy or sell signal in the current market environment, in the context that we’ve just seen a cross above the long-term line from Iron Mountain shares, we would be wise to take it at face value. That context includes Friday’s cross of the 200-day moving average line on high volume (on no company news). That context also includes a move above a minor technical ceiling at $34.00, and more recently, a push up and off of the 50-day moving average line (purple). 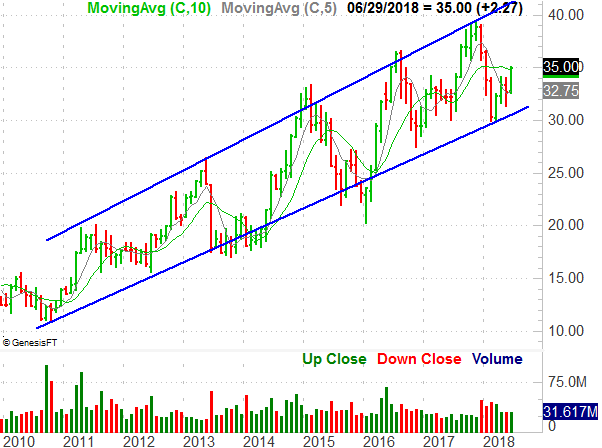 The most important context of all, though is the fact that this stock is trapped in a long-term uptrend, bouncing back and forth between a long string of higher highs and higher lows. 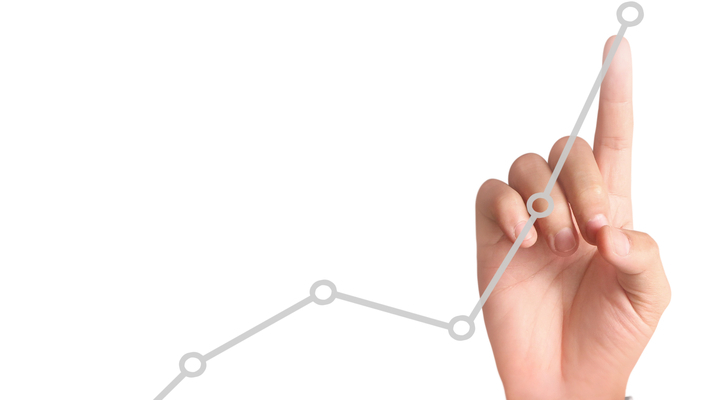 We’re just coming out of one of those lulls, meaning there’s a good amount of upside ahead. Article printed from InvestorPlace Media, https://investorplace.com/2018/06/3-big-stock-charts-for-monday-caterpillar-ppl-corp-and-iron-mountain/.